Google Allo Available For Download Now: A Feature Rich WhatsApp Competitor! 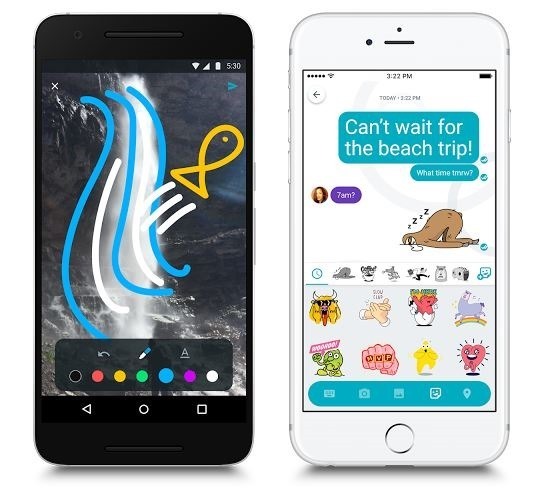 Google Allo is the second chat app from Google, other than Duo that offer video calls. 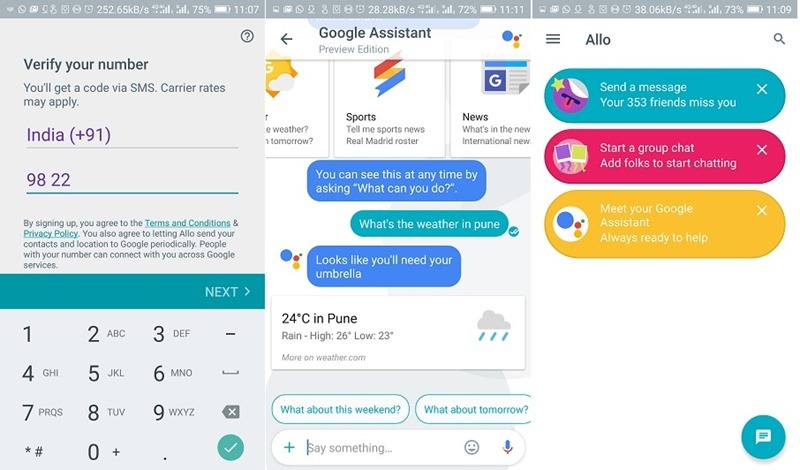 A test version of Allo was released a couple of weeks back that showed promising features and interesting user interface. Today, 21st September, marks the launch of Google Allo worldwide, and it will slowly come to your devices. The text messaging app will be available on Android and iOS and will help you make plans, find information, and express yourself more easily in chat. All you have to do is enter your phone number and Google Allo will assign a profile for you. It is very similar to WhatsApp’s authentication. The look and feel it a lot more casual and friendlier as it takes cues from Google Hangouts and Snapchat. Smart replies – This is a very simple thing, but very intriguing, because none of the messaging services out there offer smart and simple replies to people. Allo will read the chat and offer you replies you can send instead of writing down the whole thing. So when someone asks you if you’re doing fine, Allo will suggest you ‘Good’, ‘Yes’ and ‘I am’ above the type box and you can tap on these bubbles to send your message. Allo will also improve as people respond to questions and statements and will offer better and crisper replies. Photos, Emojis and Stickers – Every chat service has a lot of stickers, like FB Messenger added a host of new stickers to allow people to express efficiently. Allo also offers some exciting new emojis and stickers, and You can make emojis and text larger or smaller in size by simply dragging the “send” button up or down. Google Assistant – Google wanted to integrate a chat assistant in Allo and it is finally here! The assistant is really good and responds to any question you ask. It is like Siri without sound, that offers better and clearer results. Just type @google to bring your Assistant into any group chat. And of course, you can also chat one-one-one with your Assistant in Allo. You can ask Assistant to find a restaurant around you, or suggest vacations spots, or find a movie for the weekend and look for information on Google. Incognito Mode – The chats are encrypted in Allo, just like WhatsApp, so you don’t have to worry about privacy. When you chat in Incognito mode, messages have end-to-end encryption and additional privacy features like discreet notifications and message expiration. Just like Telegram and Snapchat, Allo will have self-destructing messages and notifications. The incognito moves a step ahead of end-to-end encryption and offers users extreme privacy and security. Allo also has a ‘delivered’ and ‘read’ options in the chat, with a single tick in white meaning delivered, and tick in green meaning read. Allo will also allow people not on the platform yet to chat through regular text messages. Google Allo seems to be very reminiscent of WhatsApp and other chat applications, but offers some interesting features that are fun to play with. Google Assistant is definitely a good start and can be made even better in future updates. However, is it enough to move people from WhatsApp to Allo? Probably just not yet, because Allo is available only on iOS and Android right now and WhatsApp supports a lot of other OSes. Google is currently rolling out Allo in phased manner for Android and iOS, and the app will be available worldwide in the next few days. "Google Allo Available For Download Now: A Feature Rich WhatsApp Competitor! ", 5 out of 5 based on 14 ratings.